History: Franz is the first born son of the illustrious Copeau family, owner of several large corporations, as well as one of the larger benefactors behind the Shadow Academy, according to family lore, the Copeau family were the first to harness the art of the mime as more than just a way of entertainment, starting with their ancestor Jacques Copeau. They learnt how to make things real, at least as real as you can make something that doesnÃ¢â‚¬â„¢t exist to begin with, and once in a while, someone with the Ã¢â‚¬Å“giftÃ¢â‚¬Â would be born. Franz proved to be such a child; uttering not a sound, even when he was pulled from his motherÃ¢â‚¬â„¢s womb. Since before he could walk, he was taught how to master this powerful gift. Personality & Motivation: A paragon of the French stereotype, Franz is both arrogant and condescending, sparing little time socialize, or indeed recognize anyone he perceives as inferior, the only thing that prevents him from leaving Freedom City and his family behind is the knowledge that once theyÃ¢â‚¬â„¢re gone, he will be the inheritor of the incredible power that they hold within their grasp, something he is all too eager to acquire. Powers & Tactics: An adept in the usage of the family secret skill of mimeofacture, the art of creating real, and unseen, objects through sheer force of will and the theatrics of pantomiming, Franz is capable of overriding many of the fundamentals of this world. :arrow: Duty; Family: Franz is the successor of the Copeau family, putting a certain quantity of expectations on him to perform, not simply well, but extraordinarily during his time in the Shadow Academy. :arrow: Prejudice; Family Members: There are few people in this world, or any other for that matter, that Franz detests more than his own family, and thwarting them and planning their untimely demise has become one of his favorite past times. Combat: 6 base attack and 4 base defense, tright? That equals 20, not 18. Grapple should be 8 (attack bonus + Strength Modifier). Please note your flat-footed knockback. Feats: Tactical Vest is +4 Protection. Explain Status. Powers: I'm really leery about flaws on the array "power". You need Subtle 2 for them to not be seen at all. Also the Create Object power seems to be a cut and paste error from the Permeate power. And I'm more than a bit leery of Subtle 2. Well, I'm going on the fact that create object says subtle 2 means they cant be seen at all. The're still detectable, but unseen. 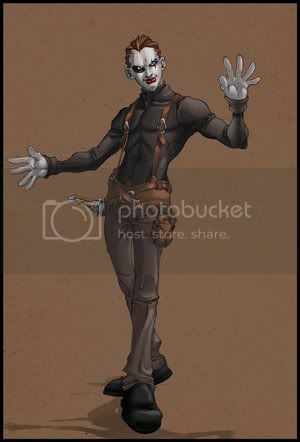 What a mime wants. Ah, right, I forgot Subtle has a slightly different definition for Create Object. Which is why he's got Defense of 4 and no other source of dodge bonus, he looses 2 Defense (which isn't horrible), but still often enough that the Flaw is still applicable, on top of that he's got an elevated Toughness, which should make up for it. Create Object doesn't give extra toughness no, but it can create stuff like walls and I've got Permeate to utilize movement as much as possible. You need to move the drawback from the power into the actual drawback section. The language there needs to be cleaned up generally; is his Immunity part of his array? His Con modifier is off. Yes, it's noted as linked to Super Movement Permeate, making it in essence one power. Now a Tier 2 NPC.